Hedging is an advanced form of risk management which is definitely not recommended for beginners. It can in fact turn out to be a lot more risky if not properly approached and also requires a thorough understanding of how the various financial instruments move as well as inter-market relationships. With a bit of practice and a keen eye for learning, traders can master the art of hedging from the very simple concepts to the more advanced. Hedging in the financial markets is defined as taking counter positions in the market in a way that the risks on the trades become net zero. In simple terms, if you buy and sell a currency pair at the same level with a 10 pip take profit and a 10 pip stop loss, both your buy and sell positions are exited with no loss as the gains in position is offset by the losses in the opposite position. But the above example is just very basic and contrary to what one might think, hedging can be used in many ways. Professional traders make use of advanced hedging concepts to even turn around a losing position. Hedging can be applied to any market, from futures contracts, to currency pairs, to stocks and options and can also involve trading different assets or different financial instruments. Hedging with correlation is based on the fact that some assets tend to be positively or negatively correlated, i.e. moving in the same direction or in the opposite direction. A good example of this is the equity markets and Gold. Equity markets are considered to be risky, while Gold is a safe haven asset. When the market’s risk appetite increases, equities tend to outperform the safe haven Gold, while during times of market uncertainty, investors prefer to reduce their exposure in the risky assets and bid up their positions in Gold. So, if you had a long position in the S&P500 futures but are unsure on how the markets will react to a certain upcoming event, you can hedge this position with Gold by taking simultaneous long positions in Gold as well. This way, if your S&P500 futures long position starts to fall, you can offset these losses with the long positions in Gold. The risk here is that if the S&P500 futures continue to move higher, then your long position in Gold will start moving into a loss. This brings us to the next point which is to use different financial instruments to offset the losses. The chart below shows a visual depiction of these two markets move in a negative correlation. Traders can also use similar correlation strategies in the currency or forex markets. For example, currency pairs with USD as the base currency move in a similar direction, such as USDJPY, USDCAD, USDCHF, while currency pairs with USD as the quote currency move in the opposite direction, such as EURUSD, GBPUSD, AUDUSD, NZDUSD. The chart below shows a comparison with USDCHF and USDCAD on the top while EURUSD and GBPUSD are at the bottom. Using this approach of currency correlation, you can offset the losing position in one currency pair by taking the opposite position in a negatively correlated currency pair. Derivates such as options are commonly used to hedge one’s position in the markets. It is widely used in the stock markets. With options trading, due to the fixed risk that they offer, traders can make use of this information to be able to better offset their risks. For example, if you had purchased shares in AAPL’s stock but you are unsure if the stock will reach your target price and you notice a risk of a decline in the price, you can either exit your position, or use options to hedge your long exposure. The above chart shows how options contracts can be used to hedge a position in the stock market. In the above example, a trader bought shares in Apple Inc. at $80.0. After prices moved steadily, they started to reverse near $119. Does the trader exit his position or can they do better? The trader first decides that they will exit if Apple’s shares falls below $103.3. Then, they purchase PUT options (which is a bet that Apple shares will trade below $119 in a month). The amount they invest in the PUT options contracts (the risked amount) would be less than the profits that is already locked in ($103.3 – $80 = $23.3). If Apple’s shares continued to fall below $103.3, the trader would make a profit of $23.3 from his long position and would also make additional profits from their PUT options contract which would expire in-the-money. However, had Apple’s shares continued to rise above $119, the PUT options would expire out-of-the-money with the trader losing the money invested in the PUT option, but they would be able to continue holding on to their long position in Apple, which now trades above $119. This example illustrates an advanced form of hedging which uses different markets in order to mitigate risks. Hedging methods when applied correctly can be of great help but of course comes with a lot of practice. While hedging is primarily used to minimize risk, traders should know that the smaller the risks, the lower the profit potential. In the currency markets, hedging can be a way to ensure that you can recover the losses from a losing position or at the very least, minimize these losses. Assume that you took a short position in EURUSD based on the bearish moving average crossover, with the entry price at the black horizontal line. After falling a few pips lower, price starts to reverse and moves closer to your stop loss at the red horizontal line. Ideally, this would mean losing out on some ‘x’ number of pips in the EURUSD short position. With hedging, you can take a long position in USDCHF and exit the market in order to recover the lost pips from the EURUSD short position. 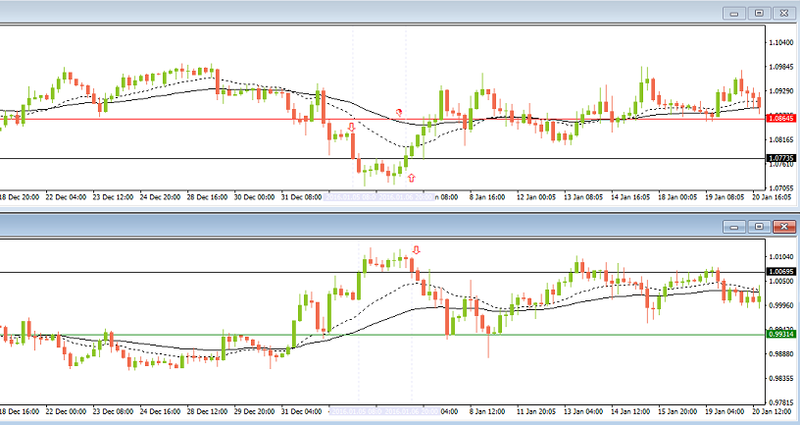 As you can see from the above, what could have turned out to be a losing trade in EURUSD, can now be turned into zero loss with the hedged long position in USDCHF. The risk here is that prices reverse mid-way and continue to push lower in EURUSD, in which case you would be stopped out of the USDCHF hedged long position. This would mean that your take profit levels in EURUSD will need to be placed at a price level where the losing trade from USDCHF is also recovered. The above methods outlined in this article show the many different ways traders can make use of hedging in order to minimize their risks on an existing position. While it looks simple enough, you need to understand how the markets behave and also ensure that the positions you take on the trade, including the stop and take profit levels should be able to cancel out the risk on the other trade.